avalakki bisi bele bath recipe | aval bisi bele bath recipe | avalakki recipes with detailed photo and video recipe. traditional karnataka recipe which is mainly prepared from rice and lentil. but in this recipe poha or avalakki is used instead of rice. 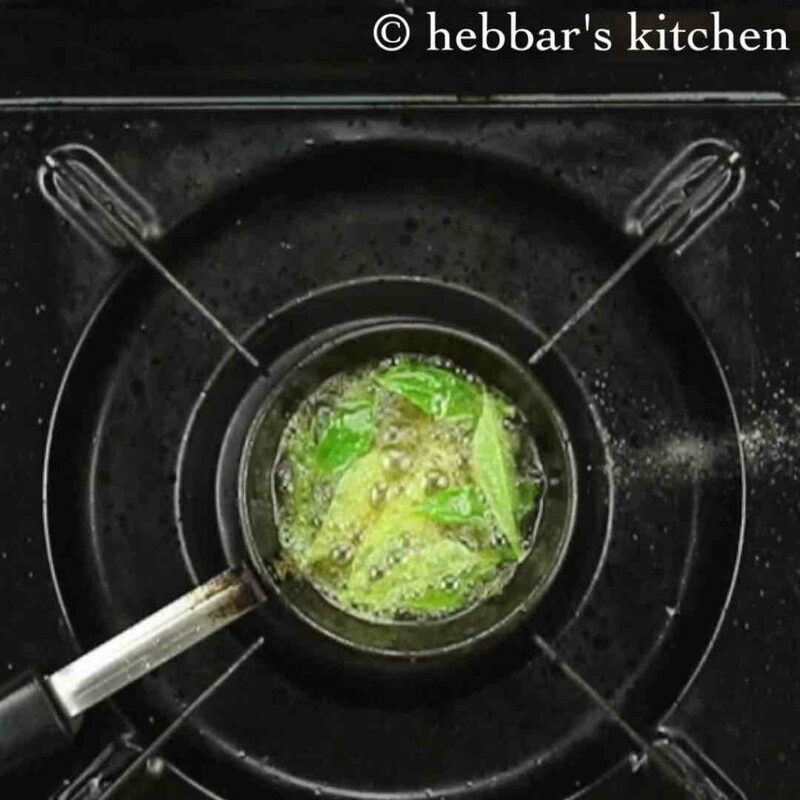 bisi bele bath – a popular kannada recipe which can be easily served for breakfast, lunch and even for dinner. 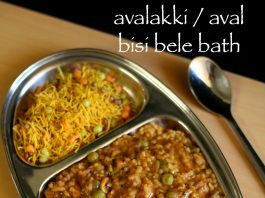 avalakki bisi bele bath recipe | aval bisi bele bath recipe | avalakki recipes with step by step photo and video recipe. avalakki bisi bele bath is prepared during fasting season especially if rice or grains are prohibited. it is typically served with chivda or boondi mixture and raita recipes as side dish. 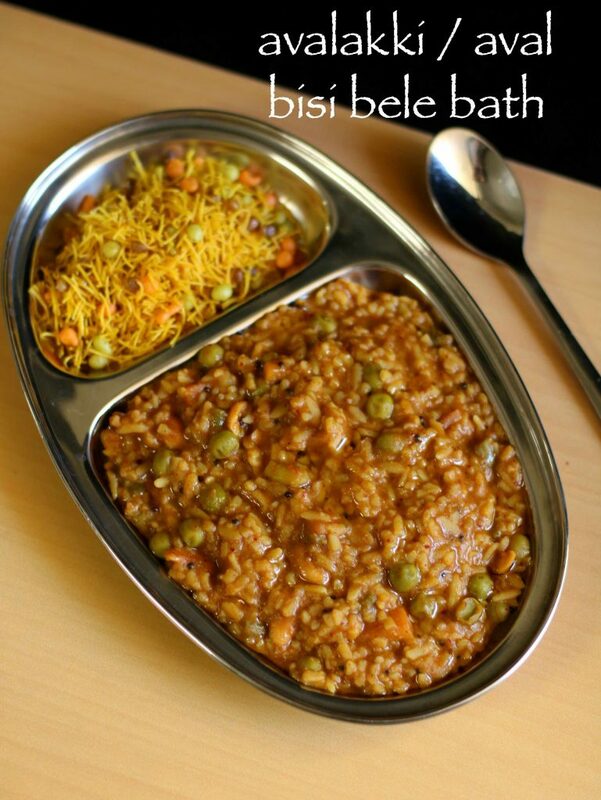 i have already prepared the authentic bisibele bath recipe which is purely prepared with rice and lentil. however, i was getting several request for aval bisi bele bath which can be consumed during fasting. in my hometown, this recipe is very popular and prepared especially on ekadashi and even on sankashti. also, it is prepared for dinner as many does not consume grains or avoid rice recipes during night. but for me it is yet another easy option for breakfast as i do not have to prepare rice separately. 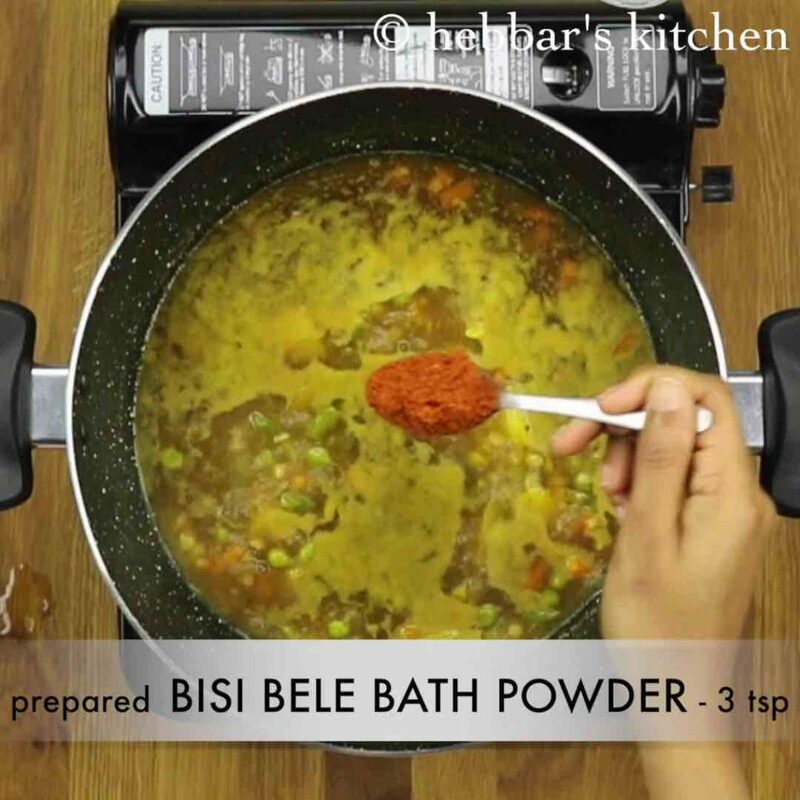 furthermore, some important tips with respect to bisi bele bath recipe. firstly, adding onions to this recipe is optional and if you are preparing it for fasting, you can completely ignore it. moreover, i have not added onions in this recipe. secondly, always dry roast the whole spices before grinding. 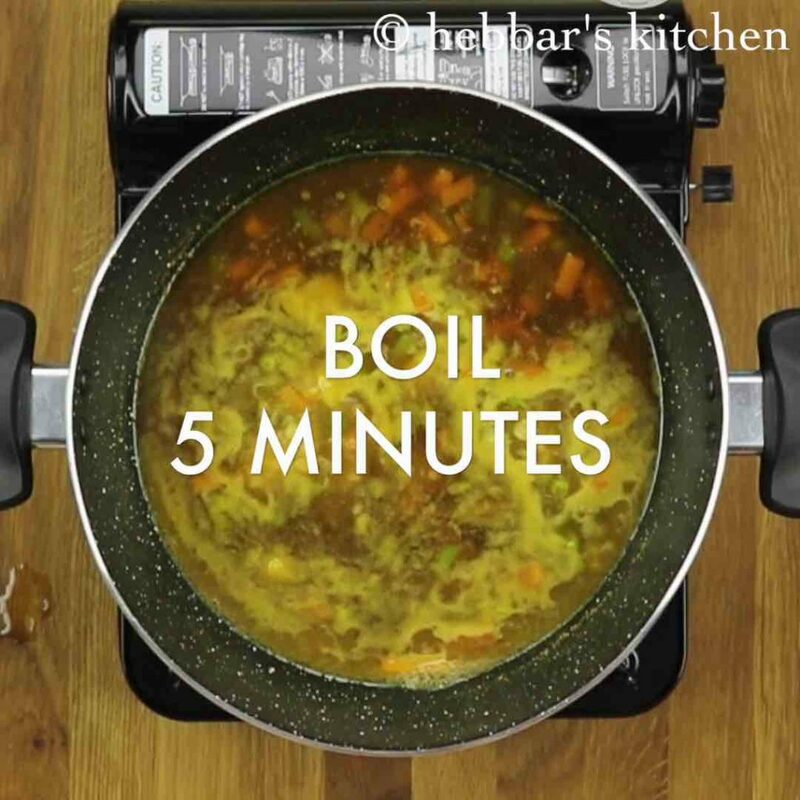 this would enhance the aroma and flavour of bisi bele bath. lastly, i have used thick poha or dappa avalakii for aval bisi bele bath. it is always recommended to use the thick poha as thin would dissolve while cooking. 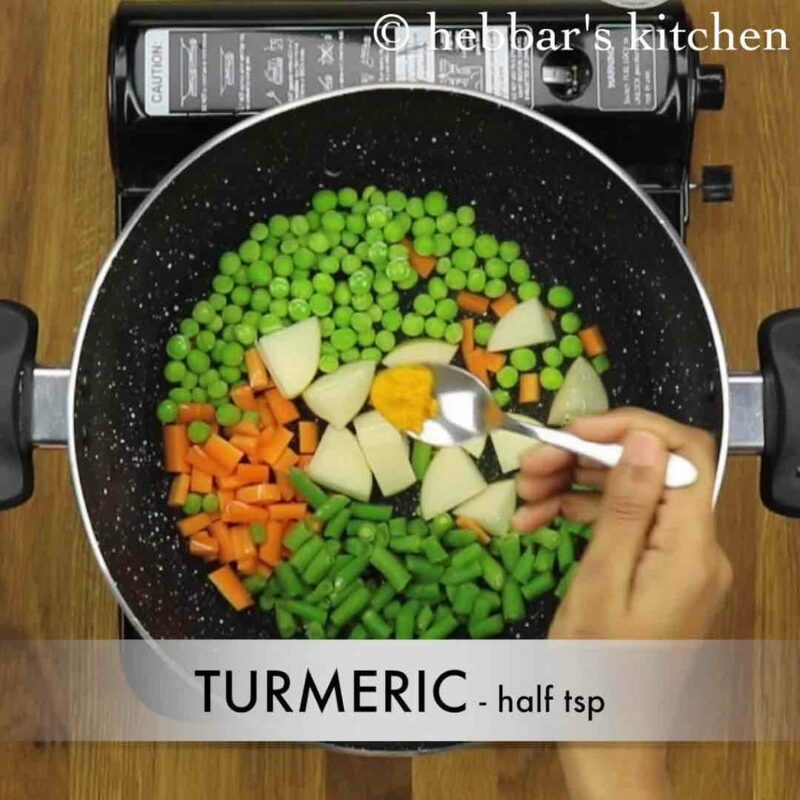 firstly, in a large kadai take mixed vegetables add cook with 2 cups. furthermore, add turmeric and salt. 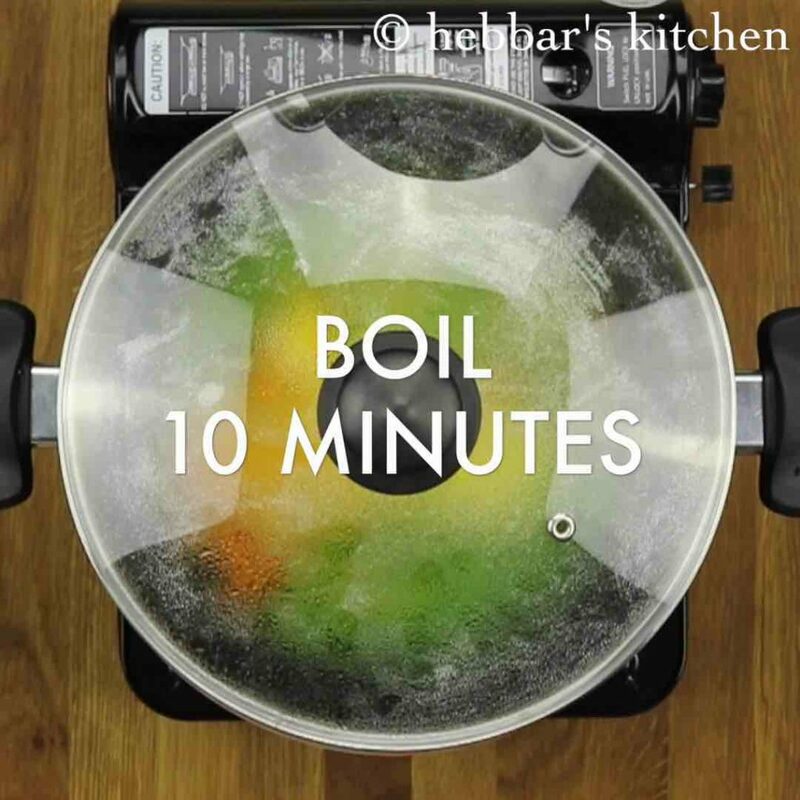 cover and boil for 10 minutes or till the vegetables are ¾ done. 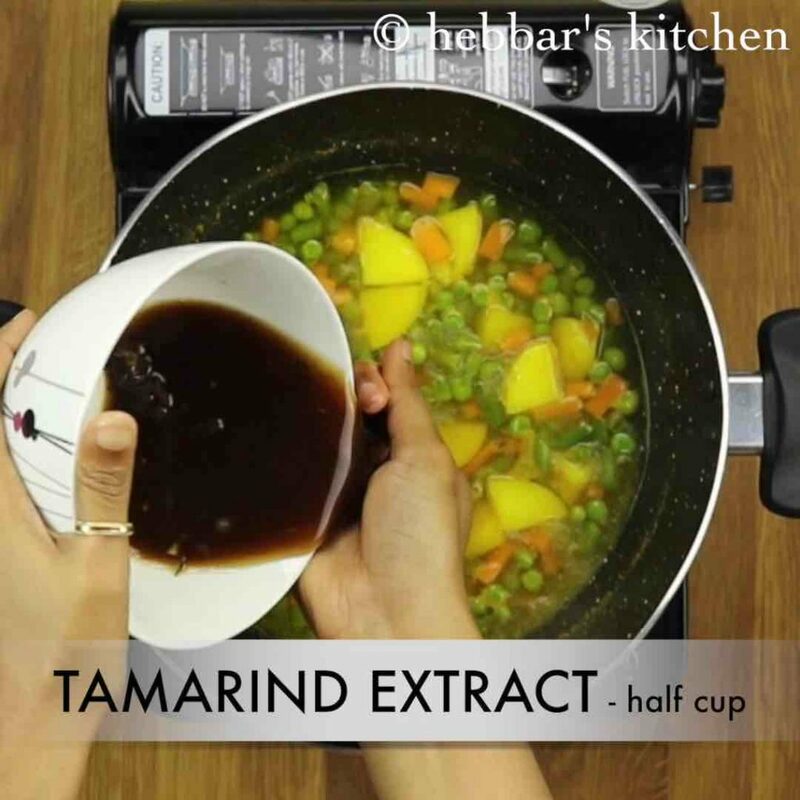 once the vegetables are cooked, squeeze the juice from tamarind. further add cooked toor dal. mix well and boil for 5 minutes. 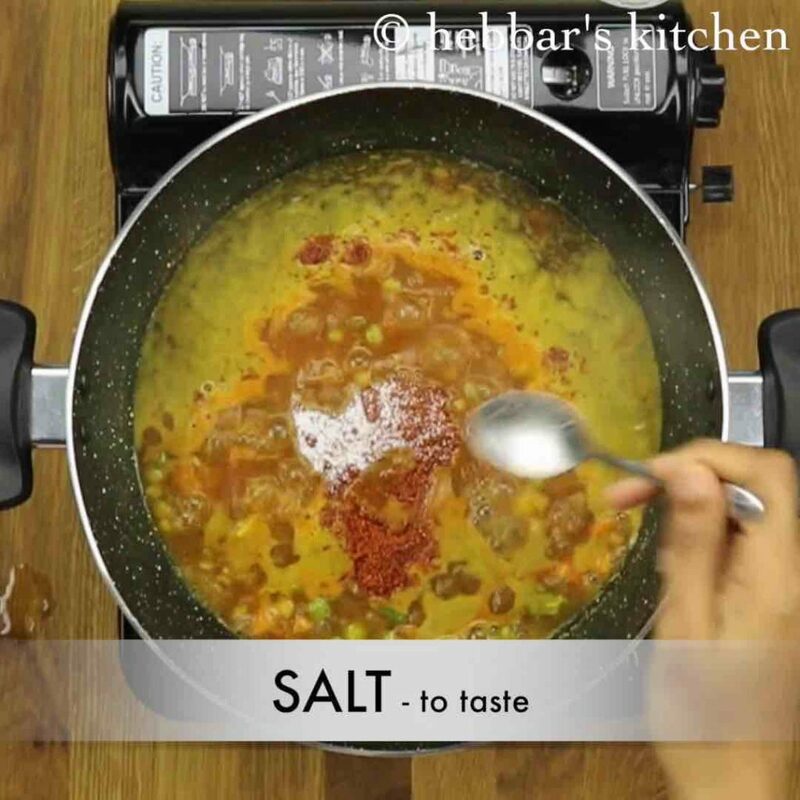 further add 3-4 tsp of bisi bele bath masala powder. also add salt and mix well. 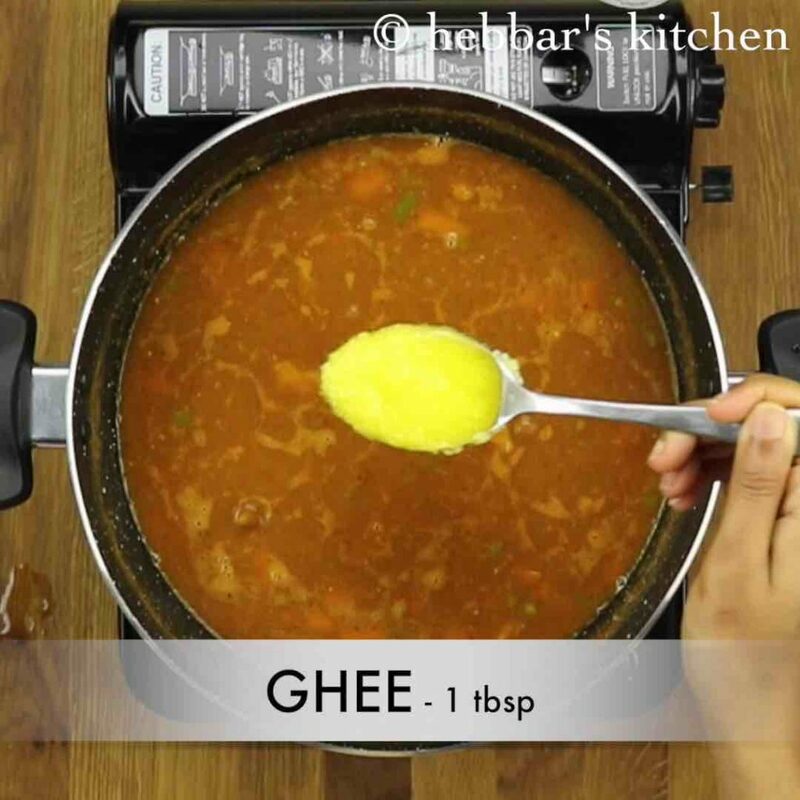 mix well and add a tbsp of more ghee. 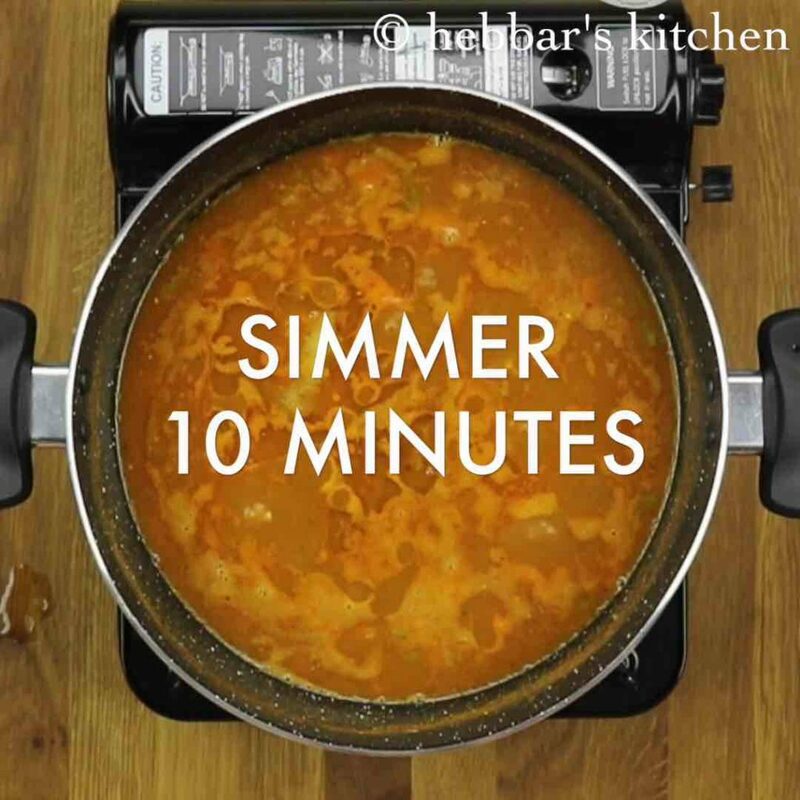 simmer for 10 minutes or till the avalakki / poha gets cooked completely. 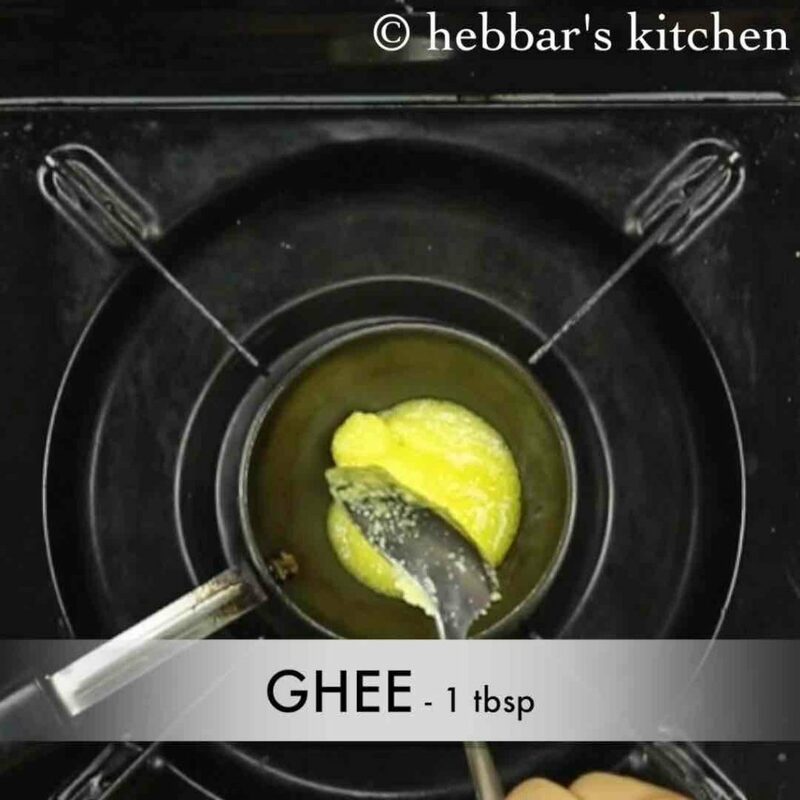 meanwhile, prepare the tempering by heating ghee. further add mustard seeds, hing and curry leaves. allow to splutter. additionally and cashews and fry golden brown. 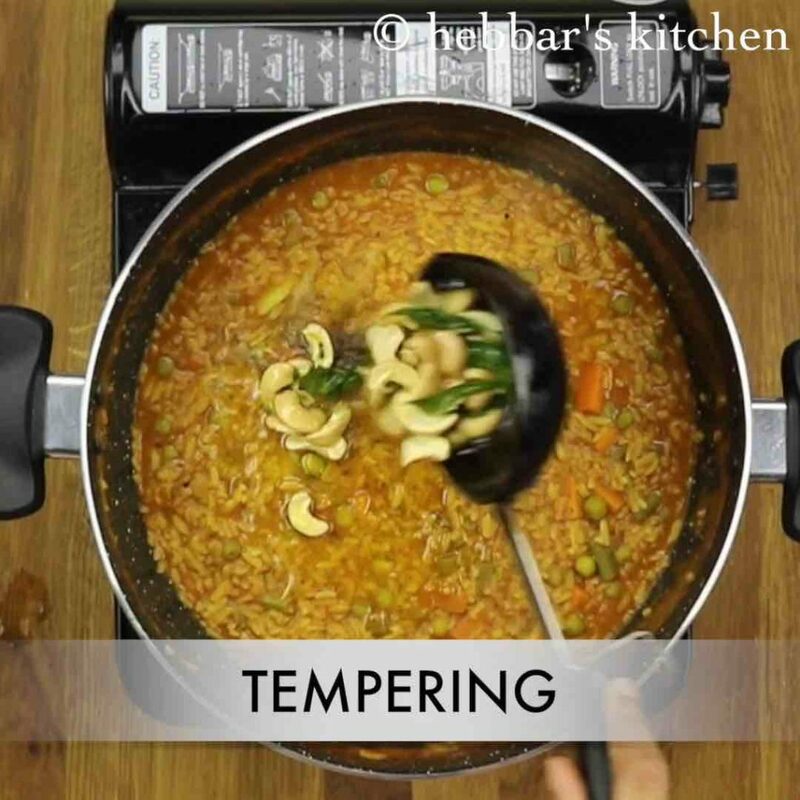 pour the tempering onto the prepared aval bisi bele bath. finally, serve avalakki bisi bele bath with raita and mixture. 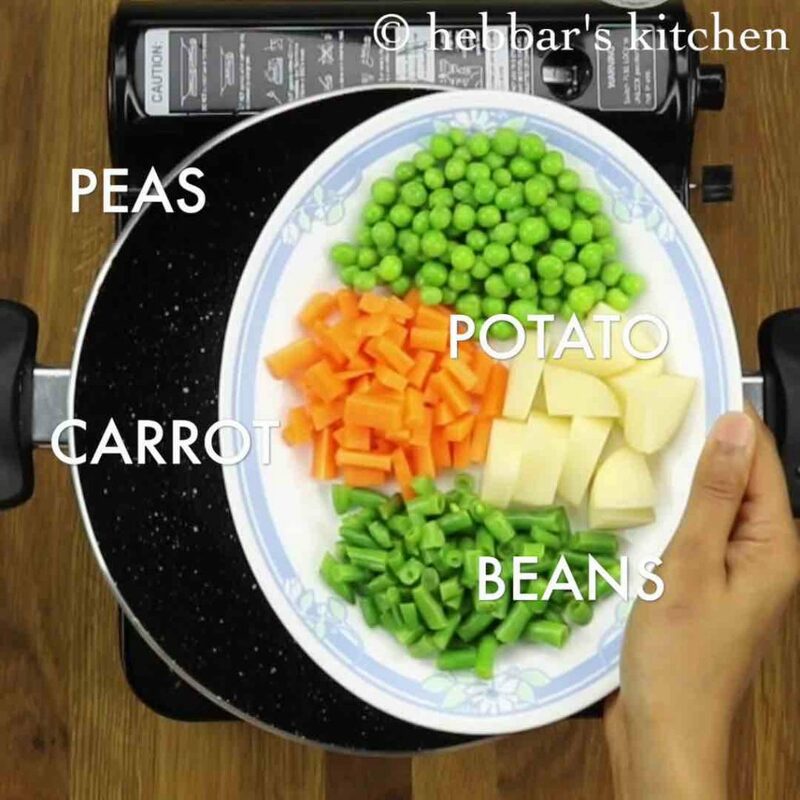 firstly, in a large kadai take mixed vegetables like peas, potato, beans and carrot. 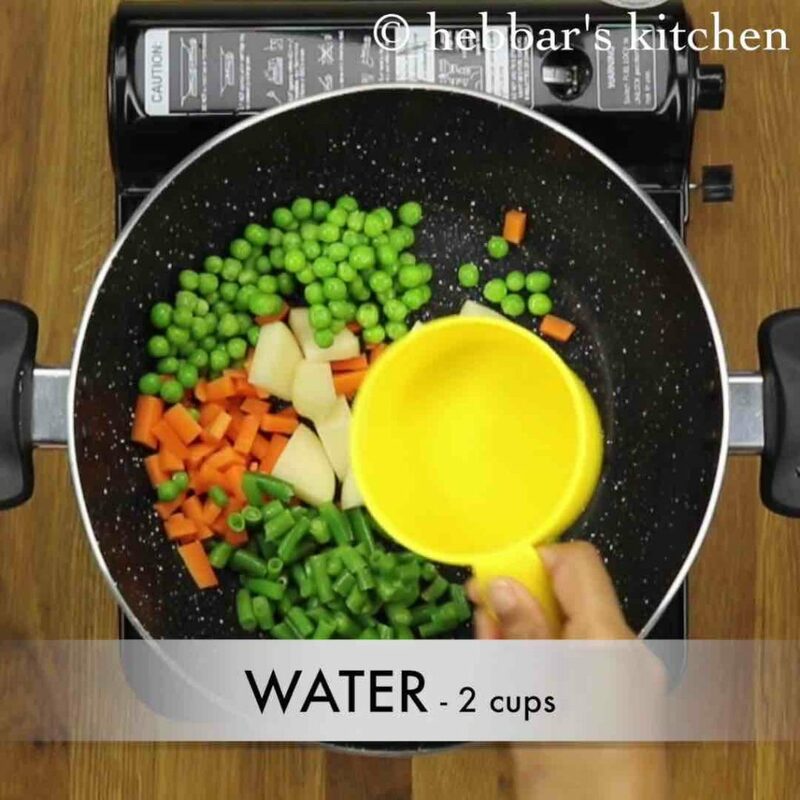 add 2 cups of water to cook the vegetables. 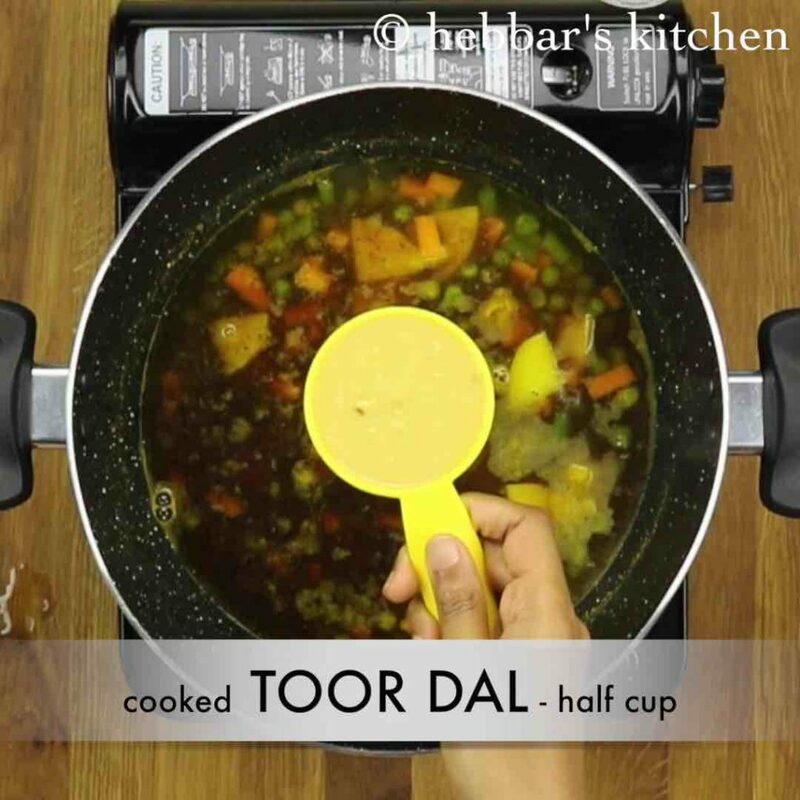 further add cooked toor dal. make sure to the mash the dal well. further add 3-4 tsp of bisi bele bath masala powder, depending on how spicy you prefer. additionally, add thick poha. 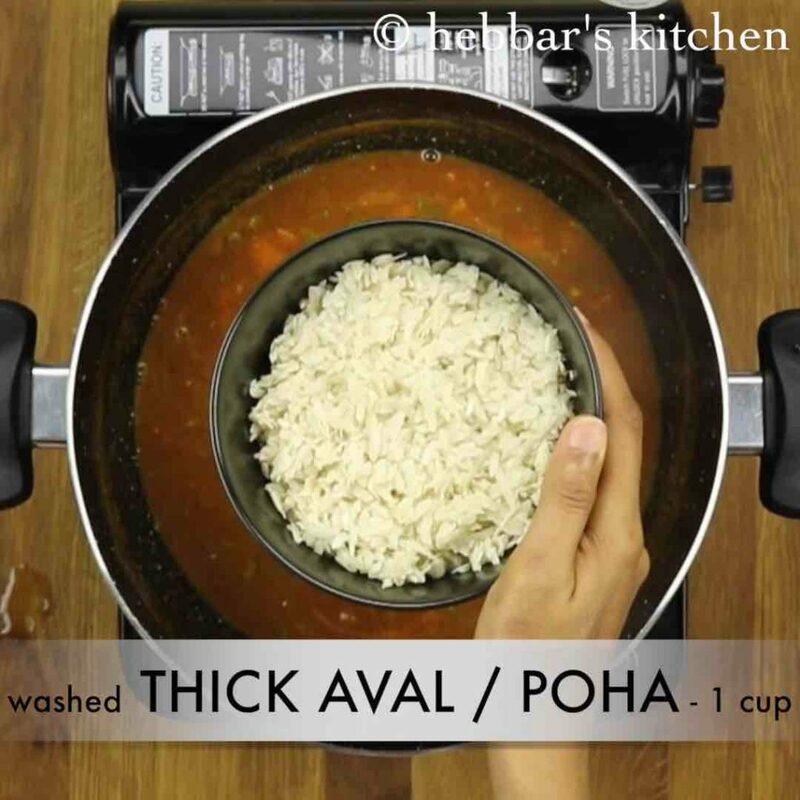 wash the poha / thick avalakki in the running water till the water runs clean. firstly, add vegetables of your choice to make it more nutritious. furthermore, adding more ghee makes bisi bele bath more tasty. 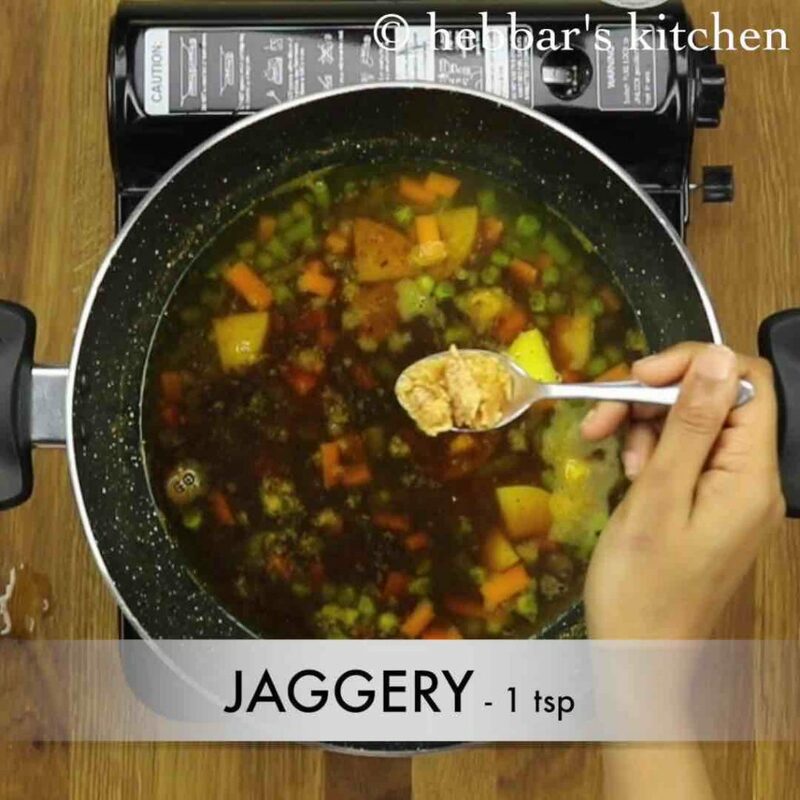 most noteworthy, cook the vegetables before adding tamarind juice. else the vegetables will not cook further. 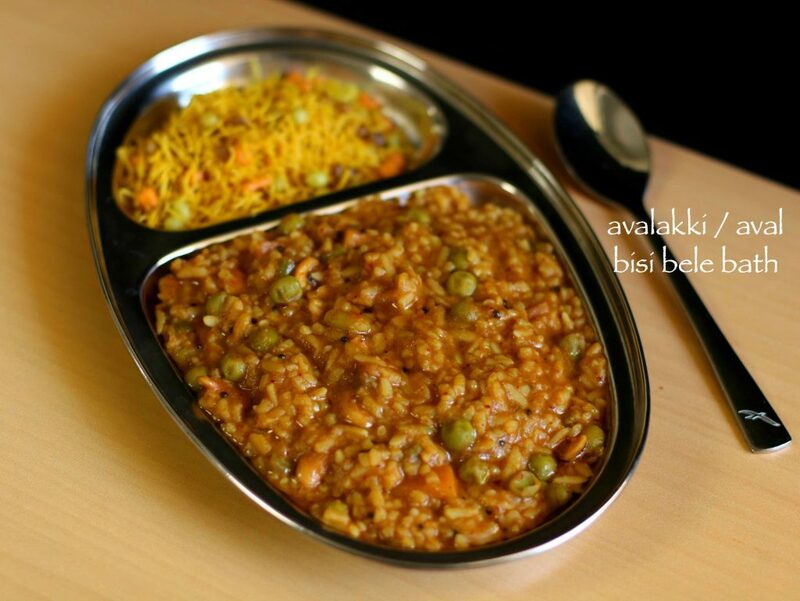 finally, avalakki bisi bele bath thickens once its cooled, so adjust the consistency by adding water as required. Hello….. Avalakki Bisibele bath… Came out very well. All family members freaked out. I am a big fan of yours. App helping us a lot. All recipes are easy to prepare. 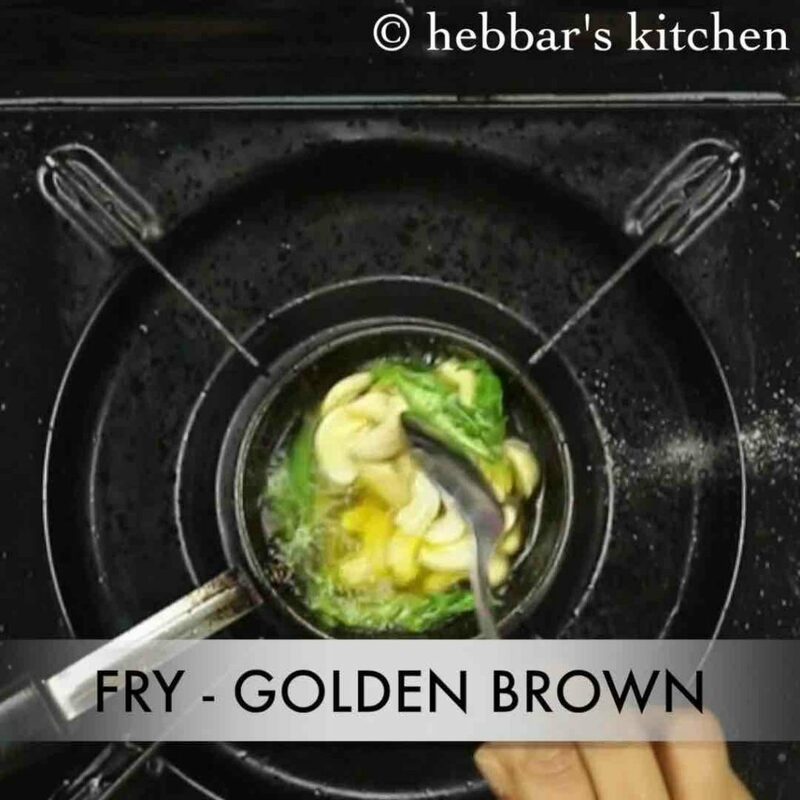 Thank you so much Hebbarskitchen.